All the controls in Intersalon are now 'Touch Enabled'. Touch is supported on the iOS browser (iPad and iPhone) and the default browser of Android 3+. Intersalon meets the demands of the growing number of tablet users by being 'Touch Friendly'. All the controls can be easily selected, dragged, resized and dropped without the need for a mouse. Salon data lists can scrolled, columns re-organised and resized. 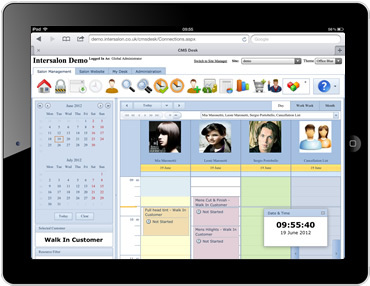 Intersalon is equipped with an iOS theme that is designed to mimic the appearance of the native controls on iPad's and iPhones. Although this theme does not fully emulate iOS element appearance, it is designed and optimized for touch interfaces. We have modified the size of tap-able UI elements to fit the average size of a fingertip, thus making them fingertip-size control elements.